1C Game Studios, in partnership with Team Fusion Simulations, is proud to announce the release of a newly updated and improved BLITZ edition of the IL-2 Sturmovik: Cliffs of Dover! As announced previously, 1CGS has partnered with Team Fusion Simulations to codify and improve their previous mod work and make it an official part of Dover. The release of BLITZ is part of the overall plan to release additional products for what we are calling the Dover Series. The Dover Series will co-exist beside our Great Battles Series. The two series will not be compatible with each other and likely cover different theaters of the war for the foreseeable future, but together both series will give you many options for gameplay and awesome content to enjoy. 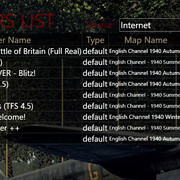 All current owners of Cliffs of Dover Classic will receive BLITZ for FREE in their Steam Library starting today. You just need to install to play. It may already be there waiting for you. If you don't already own Cliffs of Dover you can purchase from the Steam store or from our Official Web Store. If you buy from the Sturmovik web store, you will receive a Steam key that must be activated on Steam. To purchase from the Official Web Store you must have an IL2Sturmovik.com User Account. If you are reading this you likely already have one. IMPORTANT NOTE: BLITZ is only compatible with Steam and cannot be run without Steam due to its original design. From December 14th until January 4th BLITZ will be on sale for 25% OFF. The regular price after the special will be $24.99. NOTE: Purchases made in the Official Web Store go directly to the developers increasing much needed revenue. Team Fusion has spent the past several years improving and fixing issues in the original Cliffs of Dover since it's initial release. Their work has greatly improved performance and fixed serious issues. Earlier this year, 1CGS gave the source code to TFS allowing them to further improve the title. Their work is now officially a commercial product and no longer just a mod. Below is some of what is included in BLITZ. - Non- historical golf courses changed to farming. - Reduced crash generating bugs. - Added reflections to canopy glass surfaces. - Lowered the whitening effect from sun reflections in the propeller. Rename it to what? Isn't the download just an update or a whole new game? If I rename the current folder, how will the files update properly? Will I still maintain the MOD version as well as the original version folders? Thanks for a bit more information. Will the upgrade (or whatever it is) require re-mapping all the controls/commands? Will I be able to have both versions operable on my computer once I download the new version after renaming the old version? Gos, you would be better off asking that question on ATAG, I dont know the answer. I did what Scorp suggested, I uninstalled COD thru Steam and deleted (backing them up) the folders left over, then installed Blitz. I think the simple answer is yes, there are two versions of the game available on Steam, the last "official" version and the Blitz version. My question would be why would want the older version, every server will be running the Blitz version so there won't be anywhere to play the old version. Good point, Scorp. However there are only 4.3.1 servers available at this time. I've only seen one 4.5 server available and it is now offline. I am going to assume that there will be no way to have both versions operational through Steam so I'll wait until there are servers available for the new version before downloading and installing it. Just tried connecting with CoD Blitz, there are 9 servers online, 3 need a password to join all the others are running 4.5 (Blitz). I am not seeing them. I see only three servers available at this time. Do you see the TWC Mission server and Danger Dogs with the new version? OK, that 'splains it. Once the newer version is installed, the older version servers do not show up and vice-versa. Looks like time to update to the new version. Thanks for the responses.